Stringjoy bass guitar strings are roundwound from American nickel alloy windings and round steel core wire. They have a full, resonant low end and a medium top end—not too bright, not too mellow — giving these strings a balanced sonic profile with optimum output. The tapers on our bass strings are halfwound to better enable the string to wind around the tuning peg and hold tune once it’s there. The process is very similar to how “silked” end strings are made, but we leave off the silk. Unless otherwise noted, our bass strings have a 38″ winding length, ideal for both 34″ and 35″ scale basses. Want to customize or get a 35″ scale option? Check out our Custom 6 String Bass String Sets. >> Nicolas from El Monte bought this item recently. To put it simply, fresh bass strings, made with quality materials and genuine care just sound and play better. 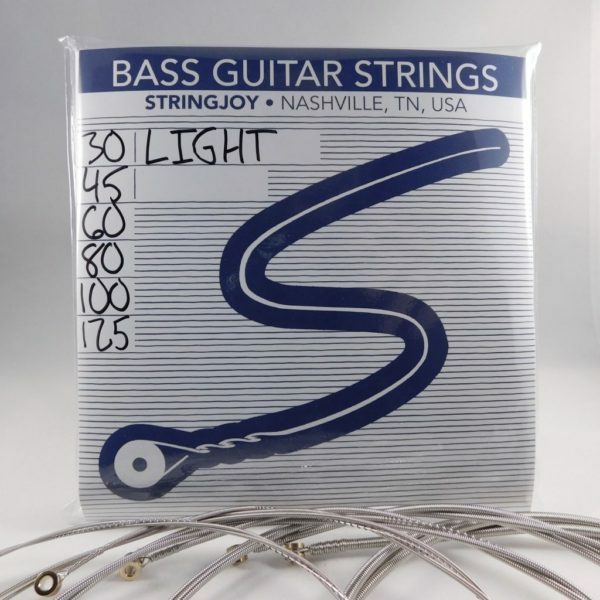 Stringjoy bass strings are made by a small team in the USA, out of all American materials: top quality nickel alloy, hand wound around a high carbon round-core steel wire. What does a higher quality set of bass strings mean for you? One last note: Our bass strings have a unique winding style at the tail end (the one that goes around the tuning peg). We use the same winding style as is featured on “silked” strings, but we leave off the silk for maximum cohesion, which leads to better tuning stability. They rule.